Discussion in 'Forza Motorsport 7' started by GTPNewsWire, Oct 4, 2017. This article was published by Kyle Patrick (@SlipZtrEm) on October 4th, 2017 in the Forza Motorsport 7 category. gtone339, diegorborges, torque99 and 2 others like this. Calling the physics unrealistic is generous. There were times when I seriously wondered if I was actually controlling the car or whether it was just some prerecorded cut scene, the car just seemed to go around corners the same way no matter what input I gave from my T500RS wheel. I tried some online driving and basically everyone behind me used me as a pinball and just shunted me off the track (repeatedly). Apparently the online crowd are mostly ten year olds who like bumper carts. andrea, kingpen and oneloops like this. Fat Tyre, Lord Kacperov and zr1chris like this. Sadly this game is best played on a pad, the FFB is just so, so bad. MockngBrd, Philipp Albin, Double Ayyys and 2 others like this. Excluding the last section, 'weather' was said 5 times throughout this review yet twice in the Project CARS 2 one. This is a review of a game. Not a review of a game in comparison to the previous one and that's what I can see and others will most likely see differently. Yes, you can compare it with the previous game but that's what I've noticed. Forza adds a few weather settings on some tracks with ToD and it's amazing. PC does it from the start on all tracks and then improves on it in the second iteration with an improved transition between weathers and adds different types. Call me a fanboy all you like but that's just my observation. However, in this, it is only on a select few tracks and discussed like it's on every single track with lots of praise. From the list of this game, I found 8 circuits without either ToD or Weather which did in others. I'd say that should reduce the content rating because I don't think the category exceeds contemporary standards. I stand by for dividing the Content & Value For Money into 2 separate sections. A game can have a lot of good quality content and still be poor value for money due to price or any other reason. Or vice versa, a game can have a lack of content yet have a good value for money like games on PC with massive mod support which is the more likely of the 2. However, I agree with this. Although it looks to be the only one available. Considered getting an Xbox solely for this series at times for current gen. If you’re looking for a game in the car-encyclopedia mold, an automotive jack-of-all-trades, you’d be hard-pressed to find a more suitable candidate. kingpen, ykiki and breyzipp like this. Can't say I'm disappointed because it's as I expected going in, but I really wish these racers that aren't licensed titles (F1, WRC, etc.....) would consider some people aren't interested in car collecting and driving RPGs and actually racing as a priority. Seriously why do all of these devs Forza, PC, AC, GT hate a simple customized off line championship? Really that's all I want. Going to get slammed for this but I have no desire to "race" low spec beaters, SemiTrucks, hummers, etc...... Why not call it Forza Driving Game. So for someone like me the tiered system is terrible. Fine if I can't have factory spec GT car but at least let me start with a base model sport car. Something stated in the review is something I've felt for a long time, that being "making" players play some part of the game. That is a problem. You shouldn't have to make a player play a game. They should look forward to it. I use to look forward to unlocking a rare/special car or two, but now when they pretty much lock the whole game, geez it's like home work. It's the same with all the freakin intros they are so freakin annoying and why can't they be skipped. The fact that you have to "make/force" gamers to play a part of game should say something. It's really easy to see if I'm wrong, these companies already track the usage data, so give people an option to enjoy the game as they'd like to and I'd beat you'd see a majority of the touted 700+ cars don't get used. If people aren't using them that's wasted resources that could be better used on something more than ad fodder. 05XR8 and jake2013guy like this. I agree. Less so in car collecting games like this since they'll simply combine Super GT500, GT3 and GTE but more Project CARS 2. There are some classes that aren't represented in the way I like in career so a custom championship offline would be great fun. 32 touring cars at Donington Park for a BTCC esque championship. Or an IMSA one. Or anything else. Your gripe is the amount of times weather was used in one article compared to the other? I wouldn't call you a fanboy.. just something odd to focus on. Weather and how it affects the trackson the Project Cars article went on for 5 paragraphs where as Forza 7 had it in 5 seperate and much smaller paragraphs. I'm afraid I can't see what you're complaining about. No it wasn't, it was just talked about and at no point did it insinuate that it was for every track. Something stated in the review is something I've felt for a long time, that being "making" players play some part of the game. That is a problem. You shouldn't have to make a player play a game. They should look forward to it. I use to look forward to unlocking a rare/special car or two, but now when they pretty much lock the whole game, geez it's like home work. Except that it's not making you play the game. There is still literally hundreds of cars that are not locked behind these walls, so to insinuate that the "whole game" is locked behind it is extremely off base. It's really easy to see if I'm wrong, these companies already track the usage data, so give people an option to enjoy the game as they'd like to and I'd beat you'd see a majority of the touted 700+ cars don't get used. With, or without the system in place, I'd be willing to bet the vast majority wouldn't use the 700+ either way. Just like in Gran Turismo. If people aren't using them that's wasted resources that could be better used on something more than ad fodder. Except that you literally can't gage it like that at all. No one person is going to have a like for like opinion of what they like and don't like. This is a game catered to something like that, and that's a good thing, not a bad thing. I'm sad and sorry for some peoples these days. To me, and I'm 45, this is a golden age of racing games/sims. I've played 'em all (nearly!) and what we are able to get our hands on now, from state of the art hardware to incredibly deep and modern softwares is absolutely fantastic. A lot of forums participants are so spoiled and sour, focusing on the negative when there is so much to be excited about and enjoyed... or polarized on just one game and everything else is just garbage. I'm happy I find a lot more to be celebrated about these games than the contrary. Maybe I'm just stupid but if so I hope it remains that way! rixtar, Ron Williams, Maxrevv and 28 others like this. I'd buy Forza in a heartbeat if I had an Xbox. The game just looks fun to pick up and play. I've added a note about VIP to the end of the review. Given the consumable nature, I'd say the Ultimate is only really applicable to big Forza fans or completionists. That said, with the XP/CR exploits found... maybe people will want it (at least until T10 patches it). Excluding the last section, 'weather' was said 5 times throughout this review yet twice in the Project CARS 2 one. The word "car" also pops up more in this review than in our PCARS2 one. That's just as relevant. However, in this, it is only on a select few tracks and discussed like it's on every single track with lots of praise. That weather/TOD is not on every track was clearer in an earlier version of the review. That's been clarified now. I'd say that should reduce the content rating because I don't think the category exceeds contemporary standards. It has dynamic settings on 1/4 of its tracks — less than just one other title. It has more tracks than all but that same title. It has well over triple the cars of any other game this generation, and they're all done to an exceptional level of quality. It has a solid offline mode. A livery editor. A deep (and at this point, almost unique) customization suite. It has a ton of content, and that content comes with very few bugs and glitches. Thus, a 4.5. Imari, Lord Kacperov, FerrariF1GT and 4 others like this. Great review, by the way, @SlipZtrEm. Fat Tyre, Shahar, Lord Kacperov and 10 others like this. I never said that though. I'm discussing my issues with the review and as there's no GTS review to go by, I can't exactly compare it to that. Fair enough. I was just stating my opinion. Maybe the Content & Value is just too big a category to summarise in a simple star rating. Works well in writing comparatively. In all honestly I think it's a pretty fair and solid review, my props for that. I haven't touched anything else yet other than career mode and RAM Runner XP farming @ airport but from what I've seen so far it's a pretty solid and entertaining game. The entire loot crate focus / reduced credits earning had me worried initially but thanks to that RAM Runner farming it's not an issue anymore. Same for the VIP credits bonus controversy, I don't care anymore (for me personally) since the RAM Runner farming makes it all fine. However, once these XP farming loopholes are patched out (and I'm sure they will eventually) I wonder how the game economy will look like for players who get this game later and only start playing for example around X-Mas. That is a huge credits-wall to climb and most certainly not fun at all, especially not when all the day one players will already have about all the cars they want in their garages thanks to the current farming / glitching / exploits / whatever you want to call it. Inside Sim Racing also did a 30 minute video review and they honestly had me nodding throughout their review all the time as well (video link below). It starts with a disclaimer that it's not being reviewed as a sim but instead as a game played by someone who enjoyed Forza games for a long time. Their biggest issue on the con side though (and I wholeheartedly agree with it) is the absolutely horrible AI. I don't know if the root cause is the bad basic AI behavior or the added player behavior these drivatars supposed to mimic, but the end result is just horrible. Combine that with some weird "sticky cars" physics when AI comes leaning on you and it can lead to a lot of frustrations. I've always sworn off the replay button completely in all 4 previous Forza titles I played since I think it's a big immersion killer, fast forward to Forza 7 I really need that rewind button to deal with the ridiculous AI behavior. Add in the fact that poor AI and horrible rubberbanding effects were also the main reason Forza Horizon 3 had little staying value for me once I finished all the campaign races, this is probably the biggest red warning light for any future Forza title for me. Unless it gets fixed in FM7 but I doubt it, Turn 10 has never been big on fixing / changing / adding content other than urgent fixes and the usual DLC stuff. Talking about bugs, my XBox One experience of Forza 7 has been near-perfect in that aspect. It's not as slick as FH3 released last year (that one was just perfect - absolutely no issue at all) but nothing ground braking this time. My only 2 issues are that the game doesn't save in which car I left off (on starting the game it always returns to the starter Bugatti EB110 I picked) and then a really odd one Monday evening where on all wet races the track was completely dry the entire race. But it worked fine during the weekend so not sure what's going on there. Good review, good game. As it was expected. I already bought the ultimate edition, but i will wait till the XoneX is out. Until then, i will stick with PCars2 and have to decide if i should get an Xbox wheel for this or not. I'm reading many people dont like the way their wheels are feeling in F7, but i'm also reading some are happy with it. I'm affraid it will feel odd to get back to a gamepad in a racing game after spending so much time with a wheel (G29) in AC, PCars 2 and GTSport. I just wonder if the FFB experience in Forza 7 is worth another ~330 bucks for a G920 or T300 + wheel stand. I just wonder if the FFB experience in Forza 7 is worth another ~330 bucks for a G920 or T300 + wheel stand. Hell no. Get it on PC and use the wheel you already have, consoles are complete rip off with this wheel compatibility crap. I completely agree, this is the golden age of racing games, we are surrounded by them, something for everyone! chris4652009, Gazronicus, ImaRobot and 1 other person like this. And something for everyone to criticise! fatkid and MrCrynox like this. @breyzipp The AI is pretty shoddy but I haven’t seen any rubber banding, even on Unbeatable. If you’re quick enough, you can run away from them fairly easily. I think this may be part of the reason the AI is so dense at the moment. Once T10 adjusts them so Unbeatable becomes a real challenge, the AI will hopefully in return avoid playing bumper cars so they can actually run away from the player in return. What that is is the Ai pushing back against you, so it makes it feel like you're stuck to them. I notice it happen a lot when coming out of turns where I'm 3/4 ahead of the car, but clip their front. Because they're PIT maneuvering you it's forcing your car to pull right, even though you're pushing left. I can't entirely say if I've seen any rubberbanding. All throughout an unbeatable race, I've yet to see an Ai randomly catch up to me, nor all of a sudden speed away from me. Although, I think I feel that the very end of the last lap of a race tends to be a bit easier to catch them for some reason. No evidence whatsoever, but on some races I felt I caught up better by then. I'm wondering if that's just my pace adjusting, as that is with the long setting, and by that time its already 15 minutes into the race so I could very well be upping my pace throughout the race. Very generous rating in my opinion. I'd say my overall rating is currently pointing downward somewhere around 6 out of 10. Not good enough for a highly experienced first-party studio. Turn 10 appears to have become old, tired and without vision. MikeV27, Dresden, MockngBrd and 1 other person like this. Well I'm even older than that and I sort of agree but that doesn't mean each game doesn't have it's strengths and weaknesses. I bought FM7 Ultimate for the eye candy and don't expect to use it a lot for driving. I also have PCars 2 which is where I spend most of my time. Both run on my PC via a 1080Ti and LG 55" OLED combo and look absolutely fantastic. I've had GTS on order since Apr 2016 and when that comes out I expect to share time between that on my PS4 Pro and PC2 on the PC. This level of realism and graphics was unimaginable when I started working with computer graphics in the late seventies so I am in awe of what they can do now. That doesn't mean there isn't still room for improvement as well as the need to cater to different demographics. FM7 is the game I wanted as a 12 year old. 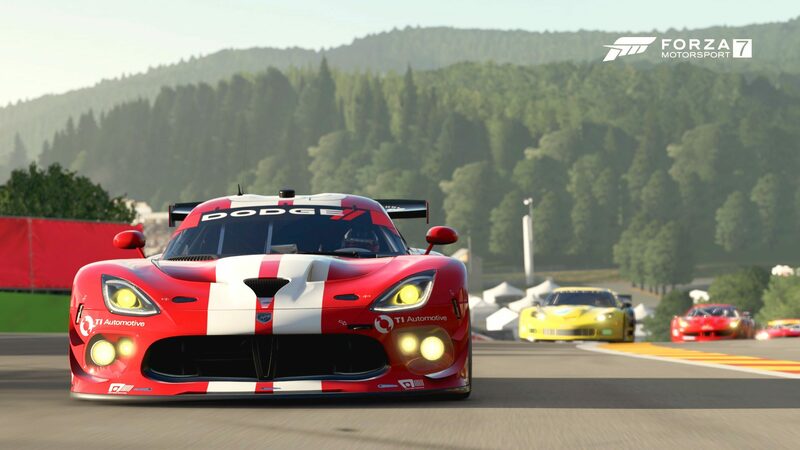 GT is where I learnt sim driving and IMHO PC2 has the best driving physics and sound but I expect GTS to have the best combination of visual eye candy and online racing fun. Double Ayyys, Gazronicus and breyzipp like this. Uhm the rubberbanding I mentioned was in FH3, not FM7. But yeah in FM7 they are often a dense pack with a few mini-runoffs (not the big runoff’s from FM6). The drivatar pacing seems fine to me for all difficulty levels, it’s just the overall behaviour and car-to-car sticking that’s annoying. I find it funny that the new, revised Maple Valley (I forgot that this wasn't GT) has 2D trees, while the version of the track from 6 years ago, on last-gen hardware, holds up better. did they forget shifting animations or something too? I find it funny that the new, revised Autumn Ring has 2D trees, while the version of the track from 6 years ago, on last-gen hardware, holds up better. The 2D trees reminded me of Gran Turismo. 100% agree, I'm early 40s and us gamers have NEVER had it so good. Don't forget to revise the note after T10's backtrack. Extra free cars and the promise of +100% cash bonus for VIP arriving as soon as it's coded has removed all of the bad taste for us Ultimate Edition owners.